Ralph Tatam was invited to give a presentation outlining the activities of the EPG at the International Congress on Optics and Optoelectronics held between the 28 August - 2 September 2005 in Warsaw, Poland. 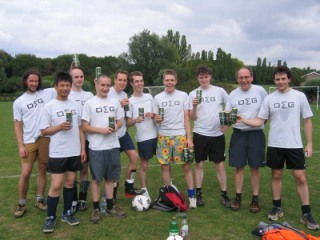 The EPG football team (aka Mongolia) continues to strive for mediocrity, gaining its 2nd wooden spoon of the year. Having lost heavily in the early rounds of the summer 7-a-side World Cup tournament, they gained a well deserved spot in the wooden spoon final. The Mongolians' reputation went before them, and the opposing team failed to turn up, gifting the spoon to the team. 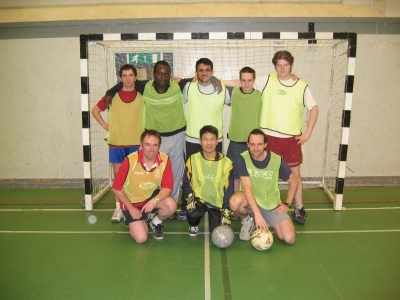 The England team, waiting for their match in the Shield competition, offered the Mongolian's a game, so that the time spent training and warming up was not wasted. It was then that the Mongolian's highest scorer of the tournament made his debut. Standing near the goals, smoking a cigarette, the mystery man was offered a game to try to even up the one-sided match. He scored two in quick succession and then disappeared for a pint. So much for training and warming up. Ralph Tatam attended the Optics & Photonics Conference held between 31 July - 4 August 2005 in San Diego, California USA. 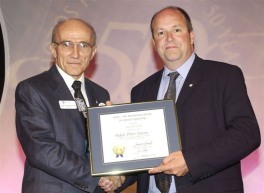 The conference was co-located with the SPIE 50th Annual Meeting: Celebrating 50 Years of Excellence. Prof Tatam received his SPIE fellowship certificate at a Fellows lunch during the conference. Presented at Condition monitoring 2005, Kings College Cambridge, UK, July 2005. Jane Hodgkinson attended the 5th International Conference on Tunable Diode Laser Spectroscopy (TDLS-05) in Florence, presenting her work on gas detection using laser pointers. Following a successful Viva examination, the examiners recommended that Sammy Cheung should be awarded a PhD for his work on Fabry-Perot interferometers formed between chirped fibre Bragg gratings. Ralph Tatam, Helen Ford and Pierre Casaubieilh attended the SPIE's International Symposium Optical Metrology in Munch. R M Groves, E Chehura, W Li, S Staines, S W James and R P Tatam Presented at Optical Measurement Systems for Industrial Inspection, Munich, Germany, June 2005. Proc. SPIE 5880, 682-690, 2005. SPIE Optical Metrology symposium (micro- and nano-technology conference), Munich, 13-17 June 2005. 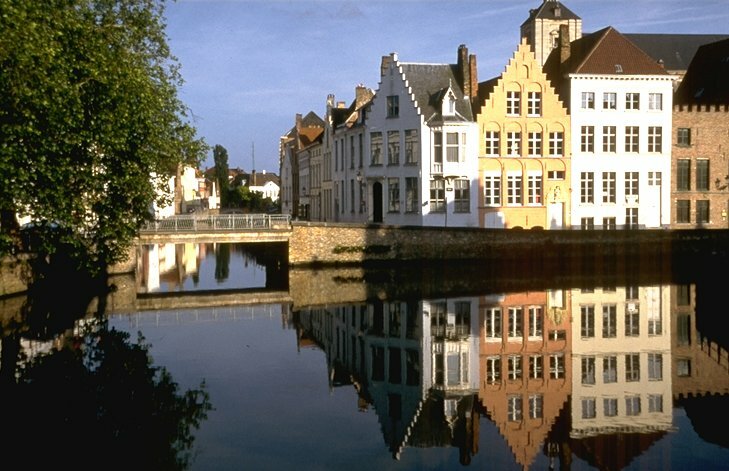 Ralph Tatam and Stephen James attended the 17th International Conference on Optical Fibre Sensors, held in Brugge. Rouard’s method as a modelling tool for the sensing characteristics of complex fibre Fabry-Perot interferometers formed between chirped fibre Bragg gratings. Ricardo Correia joins the OSG as a PhD student. Ricardo will work on a Royal Society Paul Instrument Fund project, developing fibre optic pore pressure sensors for geotechnology applications. The EPG's 5-a-side football team (aka Panathaikos) were awarded a well earned trophy in the University's Champions League competition. Finishing bottom of the group of death (well, to be honest, considering the quality of our squad, any group would have been a group of death) following a number of double figure defeats and a couple of single figure ones (one being an automatic 3-0 loss for not turning up - our best result), we qualified for the Wooden Spoon play off. At the risk of being accused of clutching at straws, we did draw the 2nd half of the game, but unfortunalety had been well beaten in the first half and so we were awarded the trophy that no-one else wanted.... but it is still a trophy and we had a good laugh along the way. Ralph Tatam has been elected to the grade of Fellow of the SPIE. According to the Society's bylaws, a Fellow "shall be distinguished through his achievements and shall have made outstanding contributions in the field of optics or electro-optics or in related scientific, technical, or engineering areas." Fellow membership shall be restricted to not more than five percent of the voting members of the Society.